I decided I want to read about every US President. I started with George Washington: Life and Death, a short biorgraphy. It's part of a series, and seems like an academic book, with each section of his lift broken up into a summary of what happened, and then an analysis that seems somewhat unbiased from the conservative/liberal standpoints. 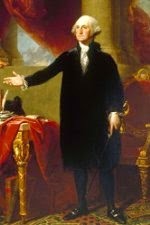 It was interesting to read about Washington. I didn't know much beyond the basics of US History, which doesn't cover his life. He became a head of household early, at 11, when his father died and left him a small estate. His education stopped, though he was a wilderness man, exploring out into the west and becoming a surveyor. His estate at Mount Vernon comes from his older half-brother, who died and left him the property. He was mostly a farmer, and appears to have enjoyed that. He was also in the militia, and rose, despite being a part of failed campaigns in the Ohio Valley against the French and Indians. He spent 15 years after that as a farmer before becoming involved with the unrest of the colonies and being put in charge of the colonists army. It's a short one, and an interesting read, but it got me thinking I really want to read another, more details, biography of Washington.